"The Panagia looks a lot like the icon of the Panagia of Jerusalem. She is exactly the same. I have seen her many times and I don't know of any other icon resembling her so much." This should not be surprising, since the Panagia of Jerusalem icon has the reputation of being an icon "made-without-hands". According to tradition, the miraculous Icon of Panagia of Jerusalem was painted miraculously in the 19th century in 1870 and has the following story. Tatiani was surprised that she was painting an icon of the Panagia! She was fearful and woke. She immediately hurried to her Abbess and narrated to her the vision. The Abbess was distrusting and told her to go and sleep and tomorrow to paint an icon of Panagia. As she returned, she could see light coming from her cell and she could smell a beautiful fragrance! She then notified her Abbess and together they entered the bright and fragrant cell, where they saw the most astonishing miracle. The Icon from the vision was before them in reality, a holy Icon of the Panagia, made without hands! “Take me down to my house in Gethsemane,” which was carried out. 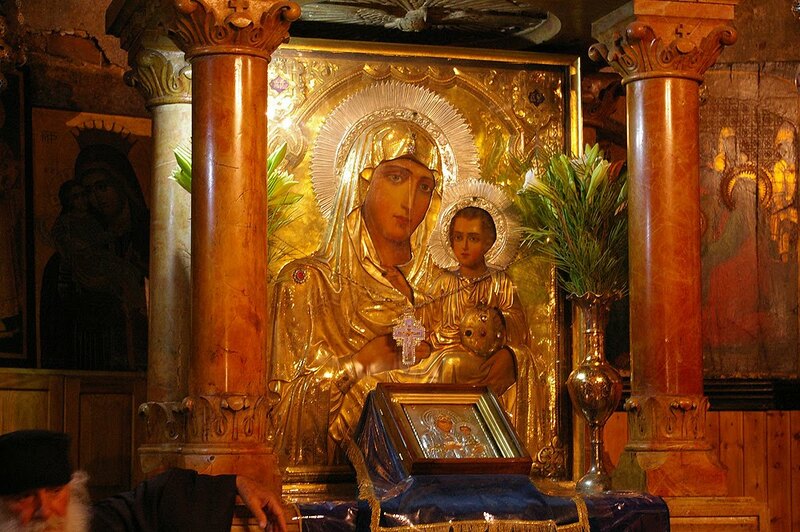 Since then, the Holy Icon Made-without-hands of Panagia of Jerusalem can be found at the Holy Pilgrimage site of the Tomb of the Mother of God of Gethsemane, where it continues to work miracles. 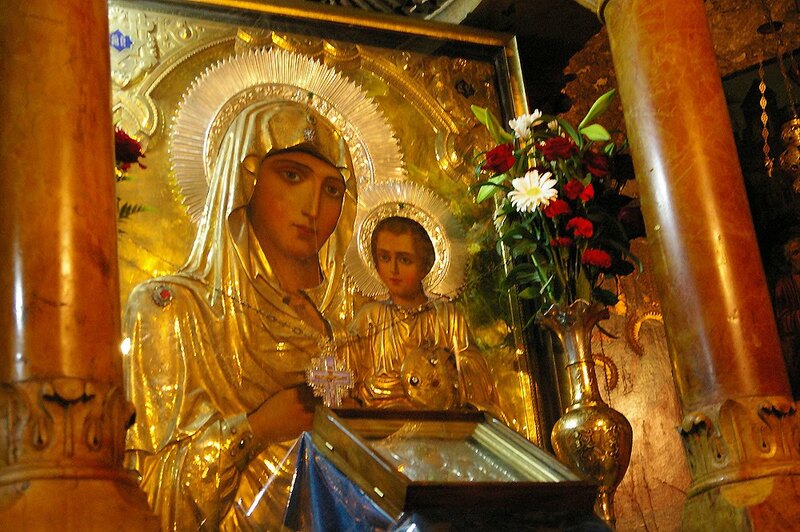 Since, according to tradition, the body of the Mother of God was taken up to heaven three days after her death, the icon of Panagia of Jerusalem is there to replace it and to work miracles. It is even said, for example, that when the Holy Church of Gethsemane flooded on three occasions, the icon left its marble throne where it is normally located, and stood by the ventilation system without any support. The miracles are innumerable. Note: There is an older icon of the Theotokos of Jerusalem icon which has been lost and can be read about here, and should not be confused with the icon spoken of above. Ἀπολυτίκιον Ήχος α΄. Της ερήμου πολίτης. For the Paraklesis Service to the Panagia of Jerusalem, listen here and see the text here.